An underground farm based in central London’s old World War II tunnels will soon begin trading as part of an urban farming model which could soon be replicated across the UK. 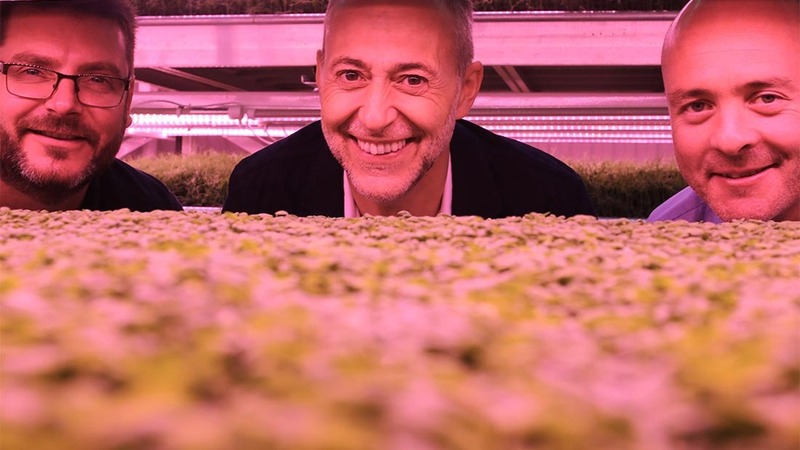 Growing Underground, London’s first subterranean farm, uses a sophisticated lighting and irrigation system to grow a range of crops including pea shoots, several varieties of radish, mustard, coriander, Red Amaranth, celery, parsley and rocket. The £1m, 1 hectare, project, which received £600,000 from crowdfunding, is the brainchild of West Country entrepreneurs Richard Ballard and Steven Dring, in partnership with Michelin-starred chef Michel Roux Jr.
Mr Ballard said: “We’re delighted that our first shoots will be delivered to the surface in the next few weeks. Crops are grown in a sealed clean-room environment with a bespoke ventilation system, advanced lighting and an irrigation system which enable the farm to produce crops at very low energy, 100ft under the ground. The high-tech computerised irrigation system uses 18 cubic metres of water which is treated on site and recirculated, meaning the farm rarely has to top up with fresh water. Farm manager Gabriel De Franco said the 18 month trial had allowed staff to prove the system worked efficiently. He said: "There are no natural pests or predators so it is easy to be chemical and pesticide free. "Underground space in London is usually overlooked as there isn’t a huge commercial infrastructure. Mr De Franco said it was a model which could be replicated on underground sites throughout the UK. “The idea is to grow to order, so we will be able to charge a premium,” he added. “We have the same yields as traditional farming but we will never have the space traditional farmers have, so I don’t think they will have anything to fear. The tunnels were used during World War II as a bomb shelter for London residents and the current site was designed to accommodate 8,000 Londoners. A neighbouring site provides an expansion opportunity to Growing Underground, creating an invisible urban growing space of several acres.